We are in the final stretch of Lent, almost to Holy Week. In just 3 days, we will begin the Mass with Hosannas and palms and then abruptly shift to the cries of “Crucify him” during the reading of the Gospel. We will begin the final steps with Jesus through his passion and crucifixion. We will travel those steps with him through the liturgy, through our prayers, through our own sacrifices, through our desire to love him and quench his thirst on the cross. A week from today, we shall stay with him in the garden. The next day we will venerate the cross by which he died. Then we shall sit vigil with his mother and his disciples and maintain a holy silence until his Resurrection. As we prepare ourselves for Holy Week, we are reminded, reminded of God’s covenant with Abraham. Reminded that God will “maintain my covenant with you and your descendants after you throughout the ages as an everlasting pact to be your God and the God of your descendants” (Genesis 17: ) Reminded that God is always there, present to his people. As we enter the holiest week of the year, as we walk with Jesus to his passion and death, we can do so with our whole hearts, confident that God is the God who is everlastingly present. We remember they didn’t take Jesus’s life, he gave it as a gift. The impact we feel at the awareness of that gift is one of the graces of Holy Week. As you walk this week, as you participate in the liturgies and prayers, remember that Jesus, the one who is, willingly did it all for you. You are so loved. Can we do anything less than give him our whole hearts in return? If you catch Sheryl sitting still, you are most likely to find her nose stuck in a book. 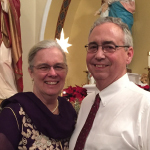 It may be studying with her husband, Tom as he goes through Diaconate Formation, trying to stay one step ahead of her 5th and 6th-grade students at St Rose of Lima Catholic School or preparing for the teens she serves as Director of Youth Evangelization and Outreach in her parish collaborative. You can reach her through www.youthministrynacc.com.